Osmo-FL2K can be considered as the [evil] transmit-side brother of RTL-SDRs. It is a driver that allows cheap $5 - $15 USB 3.0 VGA adapters to be used as a transmit-only capable SDR. It might be considered [evil] as transmitting illegally and without filtering can pollute the RF spectrum, but being responsible with it and using appropriate filters could enable extremely low cost transmitters. Recently at the October 2018 Osmocom Conference, Steve M, the man behind the Osmo-FL2K discovery and software (and heavily responsible for the development of RTL-SDR too) has given a talk titled "osmo-fl2k - the [evil] transmit-side brother of RTL-SDR". In the past he's also given a similar talk that we posted about previously. The talk goes over the discovery and reverse engineering of Osmo-FL2k, discussion of the application itself, some signals that have been successfully transmitted and some measurements. Osmocom is behind the discoveries of RTL-SDR and OsmoFL2K. If you'd like to support them please donate at OpenCollective, and check out their other projects at osmocom.org. A while ago we posted about Osmo-FL2K which is a Steve M Osmocom project that allows you to use a cheap $10 USB to VGA adapter as an HF - 1.7 GHz transmitting SDR. Now another similar project by Ted Yapo has been released which allows the use of a low cost FT232RL based USB to Serial Port adapter as a transmit capable SDR. It appears that the FT232RL via harmonics is able to transmit up to at least 27 MHz, and possibly higher. The basic implementation is similar to the idea used by RPiTX - that is to modulate the square wave output of a TX pin to generate an arbitrary signal at a desired frequency. Of course this results in numerous harmonics which must be heavily filtered if ever actually transmitting with some power or high gain antenna. In his hackaday.io project log, Ted shows that he's been able to transmit AM audio at 1 MHz, and has also been able to control an RC toy at 27 MHz. For the RC toy controller he's also created a simple BPF in order to reduce the harmonics. In addition to the FT232RL chip, he's also tried other serial chips like the CP2102N but found that the signal produced was not as clean. More information about the hack can be found on his project log, and on a recent Hackaday post. 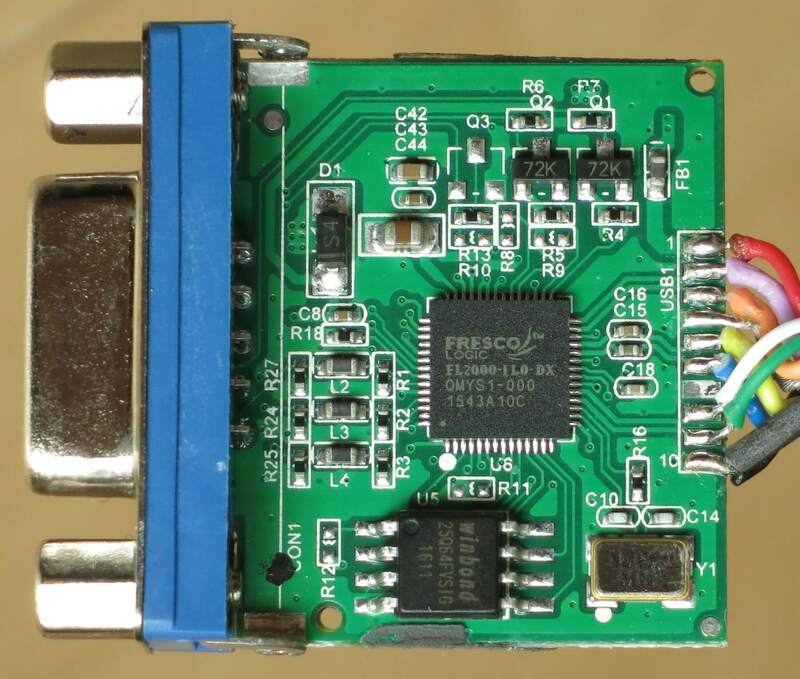 If you've recently purchased an FL2K-SDR to use as a cheap osmo-fl2k transmitter and found that it only works on USB 2.0 ports, or at very slow sample rates, then you may have received a defective unit. 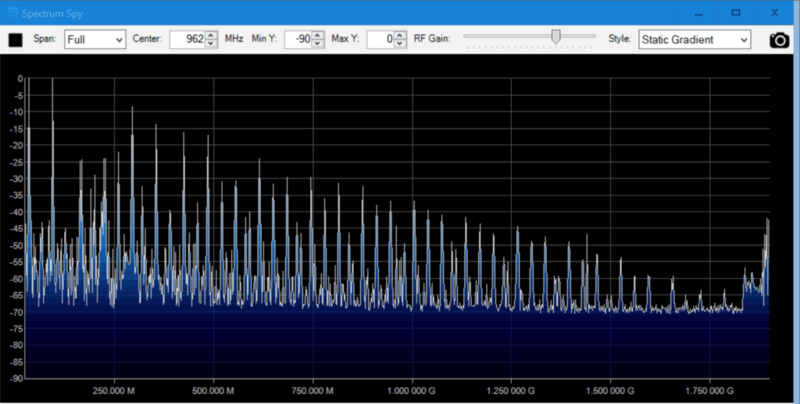 Over on his blog Yohanes Nugroho discovered that his FL2K-SDR was experiencing these issues. Upon opening it up he discovered that the wiring inside looked different when compared to the sample image found on the Osmo-FL2K website. 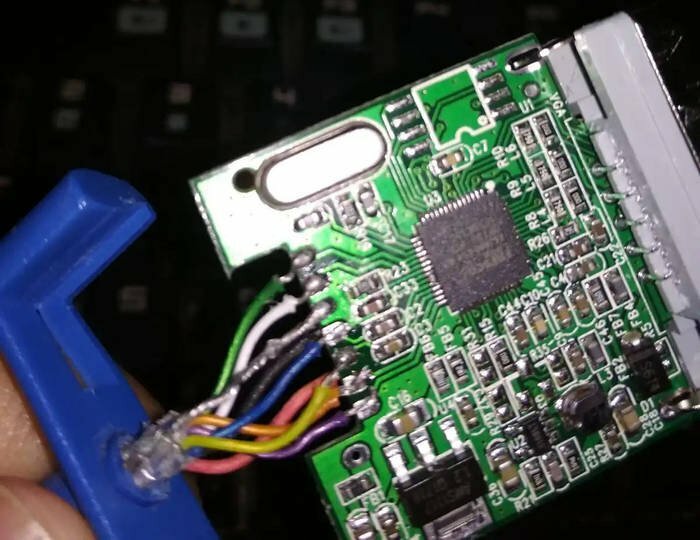 Looking further into it he found that the USB wiring was soldered on incorrectly. After resoldering the wiring Yohanes was able to get the FL2K-SDR working properly at high sample rates on USB 3.0 ports. 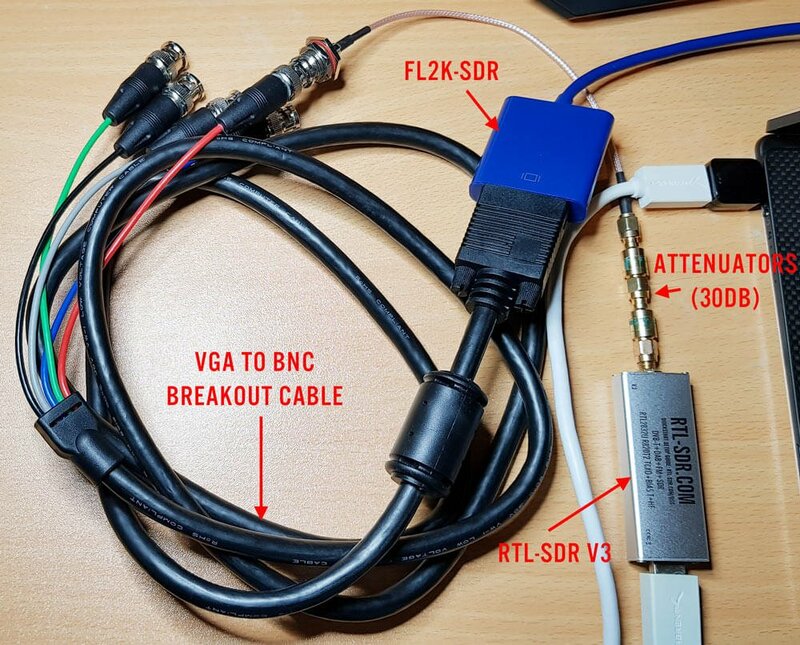 Recently we've been posting about the release of Osmo-FL2K which is a software hack that allows cheap $5-$15 USB 3.0 to VGA adapters to be used as a transmit-only capable SDR. It is an excellent compliment to the RTL-SDR. Osmo-FL2K was created by Steve Markgraf of Osmocom who gave a presentation on it at this years OsmoDevCon conference. The video was released today and in it he explains the history of VGA transmitter hacks, explains how Osmo-FL2K works and finally discusses some results. A few days ago we posted about Osmo-FL2K, which is a newly released piece of software by Steve M from Osmocom that turns a common $5-$15 USB to VGA adapter into a transmit only capable SDR. It is very complimentary to the RTL-SDR. Any USB to VGA adapter that contains a FL2K chip appears to be compatible and yesterday we received one and have been playing with it. This post is a demonstration of some of the results. Note that you must have a USB 3.0 port to use Osmo-FL2K, although a USB 2.0 might work although at significantly reduced bandwidths. Osmo-FL2K is Linux only at the moment, but it may be possible for someone to compile a Windows version, just like with RTL-SDR. Instructions for downloading and compiling the software are available on the official wiki. It is a standard git clone, cmake, make type procedure which can be done in 2 minutes. You'll also need to probably do an 'sudo apt-get install sox pv' if you want to run the WBFM example. First we tried to boot into the GNU Radio Live Linux bootable image on a tablet like laptop that only has USB C 3.0 ports. Unfortunately while the FL2K-SDR was recognized, and Osmo-FL2K detected it, there was no signal coming out during test transmissions. It seems that there may be issues when a USB C to USB Type A converter is used. Next we tried the GNU Radio Live Linux bootable image on a desktop PC and this time Osmo-FL2K worked fine when plugged into a USB 3.0 port. However, plugging it into extended ports seemed to cause it to not be detected. So if you're having trouble getting Osmo-FL2K to work, try other USB 3.0 ports on your PC, and avoid USB C adapters if possible. We also tried Virtual Box, however the FL2K-SDR wouldn't connect to the Linux guest system, even though USB 3.0 was enabled and the extensions were installed. For VMWare it appears only that the paid versions support USB 3.0. Following the instructions on the official Osmo-FL2K page we were able to get an WBFM transmission up and running almost instantly. The provided example routes audio from your soundcard into the FL2K-SDR, causing it to transmit WBFM audio at 95 MHz. With this we were easily able to broadcast audio from YouTube to another PC via the FL2K-SDR although there is about two seconds of delay. To choose the frequency you choose the carrier frequency and the sample rate, and then the transmit frequencies will be the sample rate +/- carrier frequency + harmonics. FL2K broadcasting WFM with fl2k_fm. Speaking of the harmonics we had a look at them using an Airspy and the SpectrumSpy software. The image below shows that the harmonics of a signal transmitted at 95 MHz extend all the way up to the maximum range of the Airspy at 1.8 GHz, and probably further. So filtering is very necessary if you ever want to transmit over the air. Note that when broadcasting at 95 MHz (sample rate 130 MHz, carrier 35 MHz), there is also a strong signal at the carrier frequency. So band pass filtering would be required. 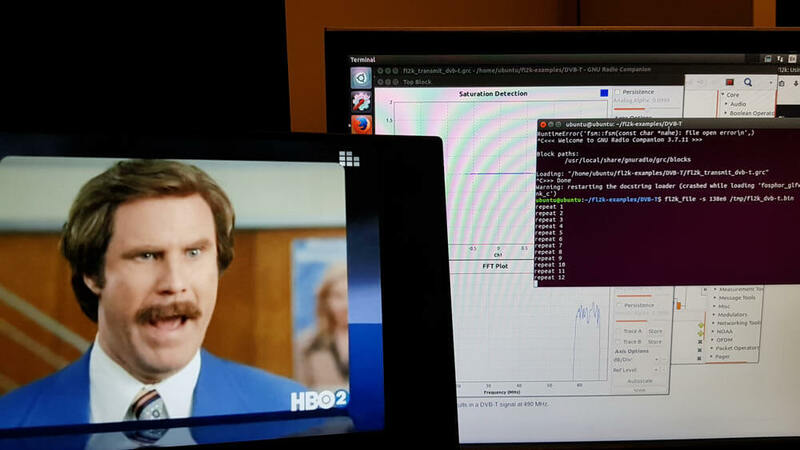 We also tested the DVB-T example found at https://github.com/steve-m/fl2k-examples, which worked flawlessly. 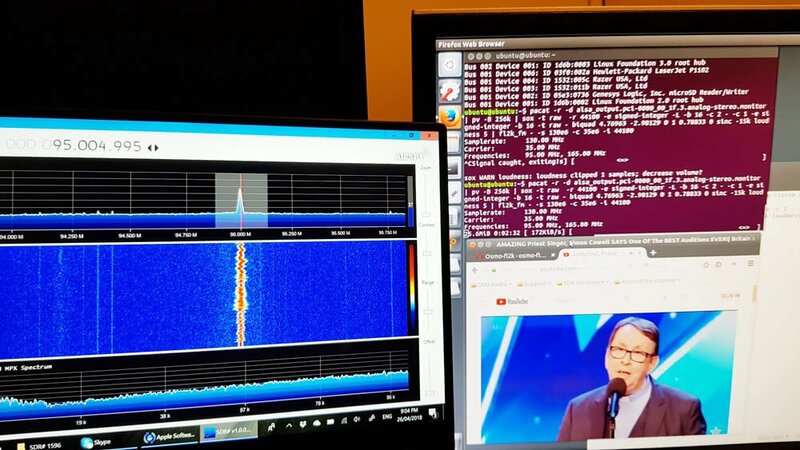 By using the connected RTL-SDR dongle with the original DVB-T drivers we were able to receive a transmitted stream at 490 MHz using the ProgDVB software. To do this follow the instructions in the fl2k-examples/DVB-T readme file to generate samples which Osmo-FL2K can transmit. Then on another PC install the DVB-T drivers for the RTL-SDR, and use ProgDVB to scan 490 MHz by manually editing the multiplexes options. Osmo-FL2K transmitting DVB-T to a Laptop running an RTL-SDR. Osmo-FL2K is quite CPU intensive, especially if higher sample rates are used. For this reason it might struggle on singe board computers that support USB 3.0. 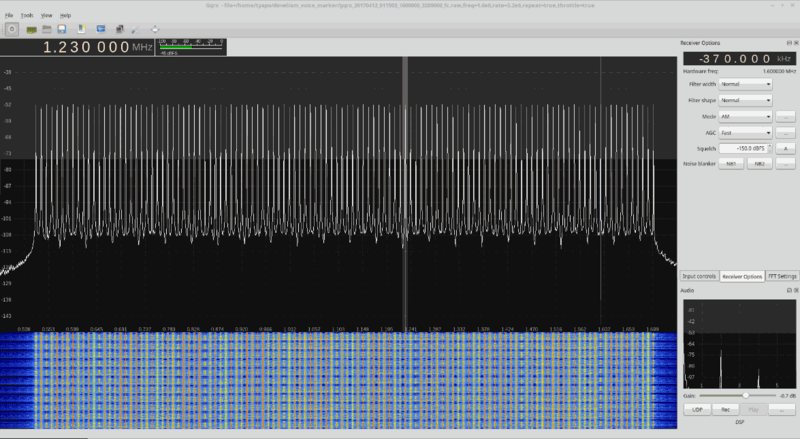 The images below show some CPU usage examples for sample rates of 20, 55, 130 and 155 MS/S. The test PC uses a fairly powerful i7-6700 CPU. Osmocom are some of the people behind the original discovery and development of the RTL-SDR (in particular Steve M), and today it looks like they have done it again by releasing exciting news of a way to turn a commodity $5 USB to VGA adapter into a TX-only capable SDR. They call their discovery 'osmo-fl2k', as the magic chip that makes it all happen is a Fresco Logic FL2000. Examples of compatible Osmo-FL2K USB to VGA Adapters. The discovery is based on the fact that the VGA specific HYSYC/VSYNC synchronizations on the FL2000 chip can be disabled, allowing for a continuous stream of samples to be sent to the VGA digital to analog converter (DAC). The FL2000 also implements a cheaper method of streaming data compared to other devices which allows these to be $5 devices. The supported hardware appears to be any USB to VGA adapter that uses the FL2000 chip. They note that these are often advertised as "USB 3.0 to VGA" adapters with a maximum resolution of 1920 x 1080 for USB 3.0 and 800 x 600 for USB 2.0. Over on Amazon the cheapest one we've found (note not yet confirmed to be compatible) that meets the Osmocom description appears to be going for $7.49 and is fulfilled by Amazon. We've seen prices of $5.11 on Aliexpress and $5.99 on eBay too. There appears to be no difference between the brands of these units, as the 'brands' are just private labelled from the same factory, as anyone can add a brand to a generic product. Once sellers catch on to the fact that these devices are going to be popular we expect them to most likely start raising prices. In terms of TX performance and functionality, osmo-fl2k should be better than RPiTX as it uses an actual DAC, instead of just PWMing a pin. It appears that the device can transmit on a fundamental frequency anywhere from HF up to about 157 MHz, and then signal harmonics can be used to extend the range all the way up to around 1.7 GHz or maybe even higher. Having harmonics does mean that like other cheap TX methods, the signal is not clean and so proper filtering would be required before any sort of higher power transmission would be legal. The highest fundamental frequency available also appears to be related to the performance of your PC's USB 3.0 controller. The worst USB 3.0 controller that they tested maxed out at 115 MS/s, whereas the best was 157 MS/s (theoretical max should be 160 MS/s). A USB 2.0 controller only gets a maximum sample rate of 14 MS/s. 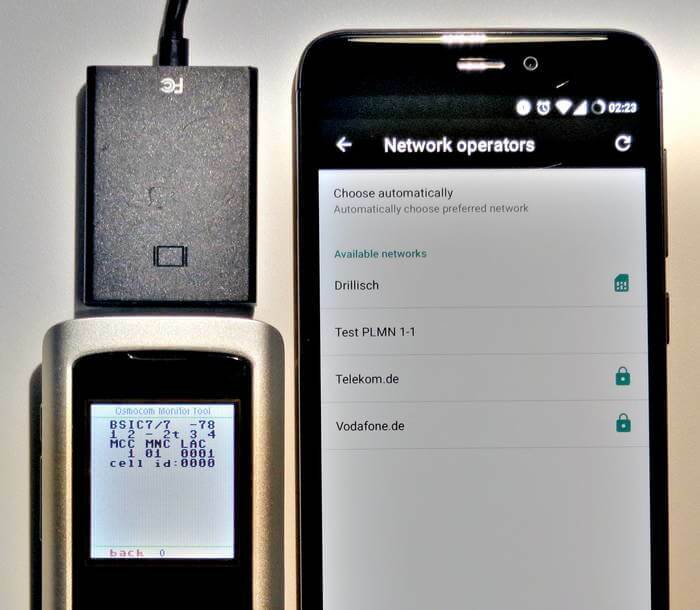 So far the team have released software examples for transmitting DVB-T, GSM, UMTS (3G) and GPS, and have mentioned that they have also successfully transmitted LTE and DAB too. There is also an example for transmitting WBFM audio with RDS via the pacat Linux command and sox. The image below shows the FL2K-SDR working as a GSM base station. If you're interested in more information, Osmocom have released the slides from a presentation that they made at a OsmoDevCon presentation on April 22. The video presentation is also expected to be released soon at media.ccc.de.